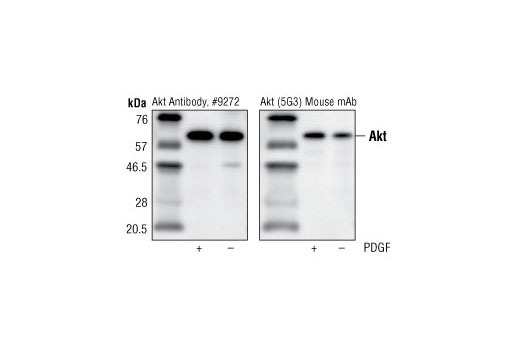 control Akt Antibody #9272 (left) and Akt (5G3) Mouse mAb (right). Western blot detection was performed using Akt Antibody #9272. 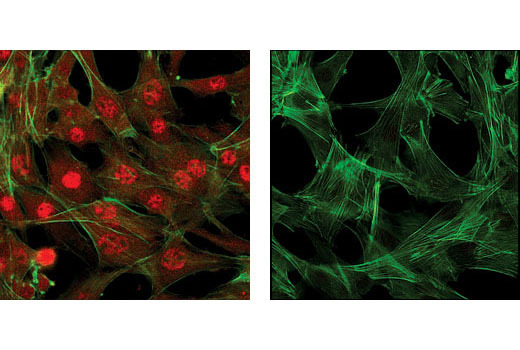 Confocal immunofluorescence images of C2C12 cells showing nuclear and cytoplasmic localization with Akt (5G3) Mouse mAb (left, red) compared to an isotype control (right). Actin filaments have been labeled with fluorescein phalloidin. 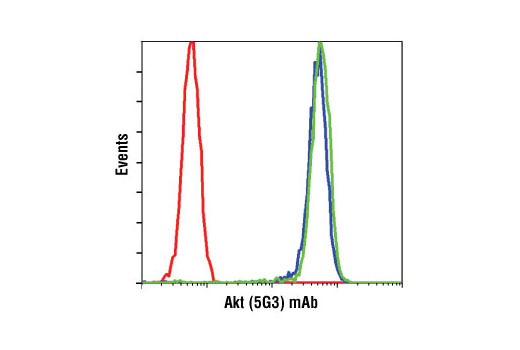 Akt (5G3) mAb #2966 staining of untreated (blue) or LY294002-treated (green) jurkat cells compared to a nonspecific negative control antibody (red). Akt (5G3) Mouse mAb detects endogenous levels of Akt1 and Akt3. This antibody does not cross-react with other related proteins. Monoclonal antibody is produced by immunizing animals with an Akt1 recombinant protein containing human Akt1 residues 140-480.